Smaller is better when it comes to the semiconductor transistor. Nanoscale Silicon Devices examines the growth of semiconductor device miniaturization and related advances in material, device, circuit, and system design, and highlights the use of device scaling within the semiconductor industry. Device scaling, the practice of continuously scaling down the size of metal-oxide-semiconductor field-effect transistors (MOSFETs), has significantly improved the performance of small computers, mobile phones, and similar devices. The practice has resulted in smaller delay time and higher device density in a chip without an increase in power consumption. 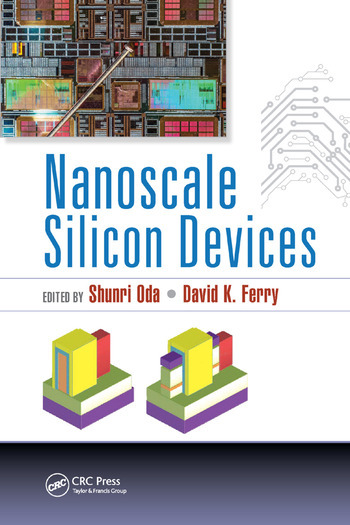 This book covers recent advancements and considers the future prospects of nanoscale silicon (Si) devices. It provides an introduction to new concepts (including variability in scaled MOSFETs, thermal effects, spintronics-based nonvolatile computing systems, spin-based qubits, magnetoelectric devices, NEMS devices, tunnel FETs, dopant engineering, and single-electron transfer), new materials (such as high-k dielectrics and germanium), and new device structures in three dimensions. It covers the fundamentals of such devices, describes the physics and modeling of these devices, and advocates further device scaling and minimization of energy consumption in future large-scale integrated circuits (VLSI). An indispensable resource, Nanoscale Silicon Devices serves device engineers and academic researchers (including graduate students) in the fields of electron devices, solid-state physics, and nanotechnology. Shunri Oda received his BSc in physics in 1974 and MEng and DEng from the Tokyo Institute of Technology in 1976 and 1979, respectively. He is a professor in the Department of Physical Electronics and Quantum Nanoelectronics Research Center, Tokyo Institute of Technology. He has authored more than 700 papers and edited Silicon Nanoelectronics (2005) for CRC Press. Professor Oda is a fellow of the Institute of Electrical and Electronics Engineers (IEEE) and the Japan Society for Applied Physics, a member of the Electrochemical Society and the Materials Research Society, and a distinguished lecturer at the IEEE Electron Devices Society. David K. Ferry received his BSEE and MSEE from Texas Tech University, Lubbock, in 1962 and 1963, respectively, and PhD from the University of Texas (UT), Austin, in 1966. His research interests include transport physics and modeling of quantum effects in ultra-small semiconductor devices. Dr. Ferry is a fellow of the American Physical Society, the Institute of Electrical and Electronics Engineers, and the Institute of Physics (UK). He has published numerous articles, books, book chapters, and conference papers, serves as editor of the Journal of Computational Electronics, and is an admiral in the Texas Navy and the Tennessee Squire Association. "This book covers recent trends and technologies of Si nanoscale devices, from cutting-edge transistors to qubits (quantum bits). It is a good book for graduate students and researchers to learn briefly about basic physics and the recent trends of silicon nanoscale devices." "It is remarkable that this book offers a large overview of carrier transport mechanisms and device physics while it is strictly focused on silicon technology. For instance, topics like spintronics, single-electron transfer, spin-based qubits, and nonvolatile magnetoelectronic devices are rarely approached on the point of view of silicon material and technology." "The authors put together the hottest topics that the nanoelectronics community is currently debating. … a good reference for researchers and/or educators who are interested in the physical challenges of future electronic devices based on charge, spin transfer, or mechanical actuation and sensing." "Very comprehensive book … written with great clarity by world-leading experts in the field. ... The topics are well selected and cover most of the subjects related to nanoscale silicon devices. … includes plenty of references for anyone who wants to get deeper."